If you or your organization is in need of a workhorse machine optimizing capacity, volume, and effectiveness, then you're looking in the right place. Our line of industrial shredders is ever versatile, being able to eat up a multitude of paper and other products. We are also introducing the capability to bale and shred with our new line of shredder baler systems. We offer an assortment of the industries finest and most trusted brands including Desoyit, HSM, Intimus, and more. Drastically increase the flow and productivity for your company and watch one of these machines pay for itself over time. Browse our excellent selections below. Waste Bin Capacity: 53.9 gal. Cycle Time in Idle Operation (theor. ): 22 sec. Shred Size: 1/4" x 1.57"
This is MyBinding video. If your company or business is looking for a heavy-duty, high-volume and high-capacity industrial cross cut or strip cut shredder, well, we have what you need. 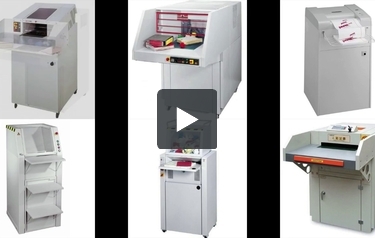 We carry a wide range of level two strip cut and level three cross cut industrial shredders from a variety of manufacturers, including HSM, Intimus, Standard, Dahle, Martin-Yale and more. You can choose from a variety of high-capacity shredders, shredder and bale systems or baling accessories to find the perfect heavy-duty shredder for your organization’s needs. We even sell shredders that recycle old materials into new packaging materials. Our website is full of descriptions and videos. We take pride in our customer service so give us a call and we can walk you through whatever you might need. When image matters, MyBinding.